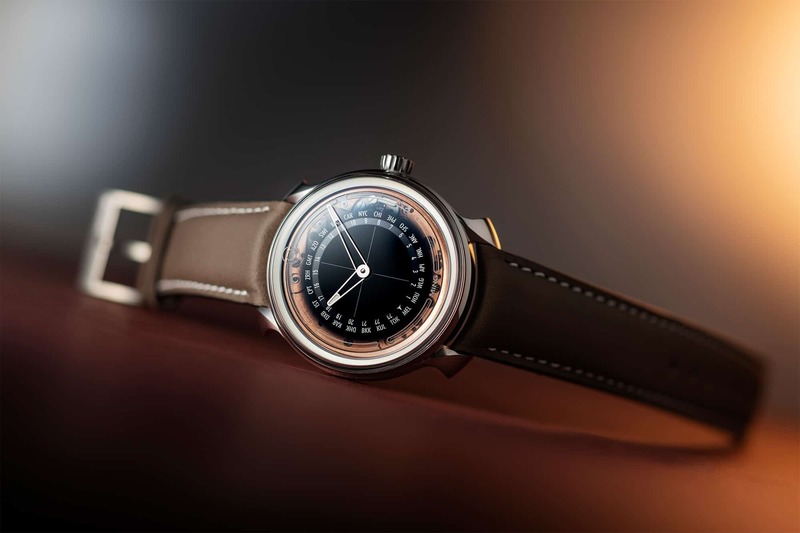 Just over a year ago, the Malaysian brand Ming, a relative newcomer to the watch world, introduced us to their 19.01. The 19.01 was a time-only piece, a worthy sophomore effort after Ming burst on the scene with their 17.01 a few months earlier (click here for our review of the 17.03 GMT). Now they’ve come up with a world-timer, the 19.02, a great follow up to the 19.01. The 19.02 is visually similar to the 19.01, but with a rose gold-plated, microrotor-driven movement that’s sandwiched between several layers of sapphire. This unique use of sapphire—not only for the front and back crystals, but the dial as well—coupled with a case made of grade 5 titanium make for a visually stunning piece. Both front and rear crystals are sapphire, each treated on both sides with double-sided antireflective coating. The front crystal is nicely domed, harking back to the domed plexiglass crystals of yesteryear. But the real eye-catcher is the sapphire dial. No indices or applied markers here. Just a simple cross-hair to aid in quickly reading the time. The dial features a radial gradient from black at the center to transparent at the edge, with a masked ring to allow the world-time disks to be visible. This transparent edge allows a peek at the rose gold-plated movement beneath. The 24 time zones are denoted by airport codes and feature a few unique locales, including Kuala Lumpur, home base of Ming. These codes are laser etched on the back side of the dial to minimize errors due to parallax. They are also stationary while the similarly etched time ring rotates. Ming designers felt numbers are quicker to read while dashing through an airport than arcane airport codes would be. Super-LumiNova X1 illuminates the hands and also a ring at the outer edge of the dial. This ring creates a wonderfully warm glow to the watch in low light. The case measures 39 millimeters in diameter, 11.2 millimeters thick, 20 millimeters at the lugs, and it’s rated to 50 meters. Ming describes the case as “in reality, a thin titanium band holding the two deep-box sapphire crystals together.” The titanium is grade 5, polished on the bezel and lugs, and brushed on the case sides. Upon inspection, one’s eyes go immediately to the lugs which, like the domed crystal, are a throwback to a kinder, gentler time and have since become a Ming signature. At once twisted and shaped in an almost art nouveau style, they complete the classic look of the 19.02. Ming tapped movement maker Schwarz-Etienne to supply a modified version of their in-house microrotor automatic. Ming calls this rose gold-plated, modified calibre the Ming ASE220.1. The ASE220.1 hacks, is adjusted in five positions, runs for 70 hours when fully wound, and features beautifully beveled and skeletonized bridges. The microrotor is bidirectional and made of sintered tungsten, giving it virtually the same weight—and thus, inertia and kinetic winding energy—as gold. Ming provides two 20-millimeter, quick-release Jean Rosseau straps done in calf with the 19.02. Signed buckles complete the look.